5 October. With disorder growing on Java and Sumatra, the Republican government transforms the BKR into a proto-army, the People’s Security Forces (TKR). There is little difference between the organizations or their personnel, however, and a multitude of pemuda and other outside groups continues to vie for power. 10 October. Much of the West Javanese city of Bandung is in local hands. Beneath the facade of Republican authority, however, an inconspicuous Japanese control remains; few weapons have been handed over. When local pemuda attempt a forceful takeover and seize an arms factory, the Japanese swiftly counterattack and within a day have subdued the city. 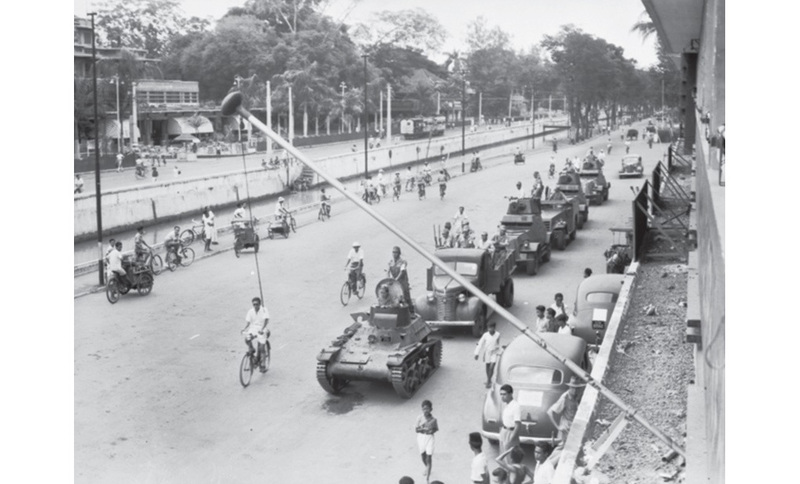 They surrender Bandung to arriving British troops on the 18th. 20 October. Two days after British forces take control of Bandung and the same day they are confronted with the carnage in Semarang, a detachment of Gurkha troops is despatched to Ambarawa and Magelang in the interior of Central Java (see map p. 283). Their goal is to secure the besieged women’s and children’s camps there and bring the internees to safety. However, trouble flares almost immediately between locals and Dutch RAPWI staff attached to the force. 15 October. Teungku Daud Beureu’eh and three other prominent Aceh ulama (Islamic scholars) agree to a statement declaring the struggle against the Dutch return is a holy war (jihad fi sabilillah) and a continuation of the ulama-led struggle of the last years of the Aceh War fifty years earlier (see p. 254 as well as opposite). 16 October. Vice President Hatta issues Proclamation X, changing the form of government from a presidential to a parliamentary system, with a new body (Working Committee of the KNIP) in a supervisory capacity. The KNIP begins to function as a parliament under a new chairman, the Socialist Sutan Sjahrir. 21 October. Mountbatten affirms that the principal role of his forces is to accept the Japanese surrender, recover prisoners of war and internees, and maintain law and order. There will be no direct involvement in political issues. At the same time he rectifies Christison’s bluntness of the month before (see p. 232) by showing support for Van Mook’s conciliatory policy. Negotiations between the Dutch and Republicans will be meaningless, however, if power lies with hundreds of armed local groups rather than a central authority – hence the more vigorous British approach in recent days. 21 October. 7,000 Singapore Harbour Board workers at Tanjong Pagar put down tools, protesting the high cost of living, demanding higher wages and condemning the shipment of ammunition to Java (apparently to be used against the Indonesian nationalists). 22 October. The mass Islamic organization Nahdlatul ulama agrees to and issues a major fatwa. This declares the fight for Indonesian independence to be a holy war (jihad fi sabilillah). The fatwa is framed in light of the increasing conflicts in the Surabaya area, and states that participation in the fight is mandatory for all Muslim men within a day’s walk of the city. This is the most widely known of the flood of fatwa issued in the early revolution. 10 October. When British troops begin disembarking at Belawan (outside Medan) and Padang, they find a newly established and assertive Republican authority. The situation encourages pro-Dutch militias to act more aggressively, provoking the first serious anti-Dutch violence in Medan on 13 October. This forces the British to despatch significant reinforcements to Medan by the end of the month. 14 October. Demands by Indonesian pemuda for Japanese troops in Semarang to hand over all of their weapons escalate into fighting. What follows is the massacre of several hundred Japanese civilians and an outraged response by the Japanese garrison. By the 20th, when British troops arrive on the scene, several thousand locals are dead. 21 October. Long suppressed by the Dutch and remaining underground during the Japanese occupation, the Indonesian Communist Party (PKI) is finally re-established. Much of the revolutionary energy and status lies with the pemuda, Socialists and other leftist groups, however, and it is to these groups that many veteran communist returnees gravitate.